IF USING BUTTERFLIED CHICKEN - Gently separate the skin from the breast at the base near the gut cavity. Ease your fingers upward carefully to ensure skin remains intact. This will create a pocket for you to push half of the Coriander and Almond paste into, under the skin. Continue to rub the remaining paste onto the outside of the skin and underside of whole chicken. 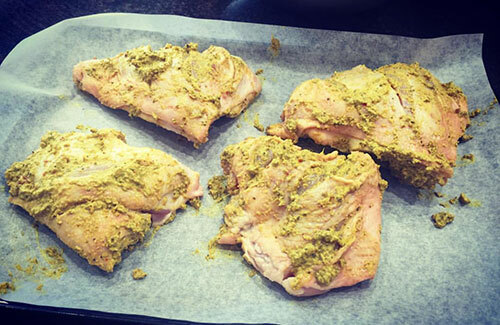 IF USING CHICKEN PIECES - Make several incisions into the flesh right down to the bone and rub paste right into cuts. Continue to rub paste onto all surfaces of chicken pieces. Allow to marinate for a minimum of 1 hour but ideally overnight. Lay whole chicken or chicken pieces onto a hot BBQ grill plate, cooking for a approx. 20 to 25 minutes - turning occasionally. Serve with a crisp salad or slice and serve on a creamy potato mash with a side of crunchy stir fried vegetables. TIP! This recipe also tastes fantastic baked in the oven (and less mess to clean up - cleaning the BBQ is not our favourite job).